Daphne Anne Vella was born on 26 August 1964 in Sliema. She studied at St. Dorothy's convent in Medina and St. Aloysius' College in Birkirkara. She attended the University of Malta as a mature student and graduated BA (Hons.) in archaeology in 1997. She married Peter Caruana Galizia in 1985 and they had three sons, Matthew, Andrew and Paul. Together they lived in Bidnija a hamlet in the limits of Mosta. Daphne was a well reknowned Journalist and Political Activist who spent most of her adult life investigating any hints of corruption within government and fighting for a more democratic country for her and her family. Much of which she reported on in her Blog entitled Running Commentary, which included investigative reporting and commentary and was one of the most popular websites in Malta, regularly attracting over 400,000 views - more than the combined circulation of the country's newspapers. This led to her and her family being harassed relentlessly and intimidated for her work and opinions. The front door of her house was set on fire in 1996. The family dog was killed, with its body laid across the doorstep. Years later, the neighbour's car was burned, probably in a misdirected attack. In 2006, two stacks of car tires were placed, doused with petrol and set alight next to the family house. The fire was stopped before it took hold by her son Paul who woke his parents, who were asleep inside. 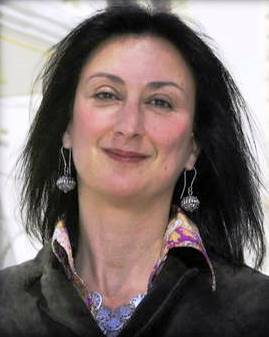 At around 3 pm on 16 October 2017, Daphne Caruana Galizia died in a car bomb attack on her rented Peugeot 108, while she was driving close to her home. The large explosion left the vehicle scattered in several pieces across nearby fields. She was in the driver's seat at the time. Her remains were found by her son Matthew, 80 meters away from the blast site, after he heard a blast from their family home. He wrote on Facebook: “I looked down and there were my mother’s body parts all around me”. Her death marks the sixth car-bombing in Malta since the beginning of 2016, and the fourth fatality. Thousands of people attended a vigil in Daphne's hometown Sliema on the night of 16 October. Another vigil was held at the Malta High Commission in London. Students, ex-alumni, teachers, parents and members of the San Anton community held a peaceful vigil from City Gate to the Great Siege monument in Valletta, in support of the Caruana Galizia family. The three Caruana Galizia siblings were all students of San Anton School. Her death has only served to ignite the desire for change. A crowdfunding campaign was initiated with the aim of raising €1 million to be given as a reward for information that leads "to the successful prosecution of the assassin and the person or persons who ordered the assassination." This was followed by a further state sanctioned reward of €1 million. My Significant Other and his family are from Malta. When they were young they ran among the ruins caused by the war. As adults, those who have had the opportunity to visit, have always seen it as a much safer place than North America. Politics aside, we are all in shock that this woman has lost her life because she brought to light issues of corruption so well hidden from the visitors of this beautiful country. We pray that Daphne will assist us from the other side in finding both her killer(s) and the truth overall.